I’ve been an Amazon FBA seller since 2013. Although Amazon is always changing things and evolving, for those of us third-party sellers whose businesses are built on Amazon FBA, there’s one thing that has remained constant. And that is the idea that spending time researching the right products to sell on Amazon is crucial to creating a successful Amazon FBA business. However, while product research is still super important, the methods of doing it only get simpler and simpler, especially when you use a product research tool like the Jungle Scout Chrome Extension and Jungle Scout Web App. Keep reading this article, and I’ll break down exactly how I find products to sell on Amazon and what hallmarks to look for. Then, I’ll show you an easy way to find products to sell on Amazon using Jungle Scout’s software. And finally, I’ll teach you how you can easily get a direct recommendation from me on whether or not a product is worth pursuing and investing in. How do I find good products to sell on Amazon? The number one question I get all the time is “Greg, how do I find good products to sell on Amazon?” I always point people to what I consider the hallmarks of a good Amazon product. 1 – Look for products with high demand. My rule of thumb has long been to look for products to sell on Amazon that are already selling at least 10 units per day or 300 units per month. Usually, products like these have Amazon Best Seller Rankings of 10,000 – 15,000, although it varies from category to category. The reason you want to have a product that sells 300 units per month is because most orders you do with manufacturers via Alibaba will have minimum order quantities (MOQ) of 500-1000 units. Therefore, if the product sells 300 units or more, you’ll have 2-3 months of inventory and won’t overstock. 2 – Find products with low competition. If you’re a huge fan of economics like I am, then you should know the basic principles of supply and demand. If demand is high and supply is low, profits are high, right? And we already addressed demand, so now we turn to supply. The less people selling the product that you’re interested in, the better. And the best way to gauge this is with product reviews. So, the less average number of product reviews a product has, the more likely you are to get ahead of the current competition when you launch your product. 3 – Seek products with good profit margins. Next, you’re going to want product to sell on Amazon that have healthy profit margins. If you don’t already know, a profit margin is the amount of money that actually pocket after you deduct fees, ad costs, and the actual cost of the product. I like to see at least $10 per product. An easy way to remember what makes a good product on Amazon is to look for products using the 10 x 10 x 1 rule. Basically, the 10 x 10 x 1 rule states that you should look for products that sell 10 units a day for $10 in net profit per product. 4 – Go for products with sales prices between $20-$50. In addition to finding products to sell on Amazon with good margins, high demand, and low competition, you’re going to want to sell your product for at least $20, and typically not too much higher than $50. The reason you don’t want to sell products for less than $20, is because after fees and product costs, there’s not much left for PPC ads or profit. Find products that have low seasonality. That means avoid summer or winter-only items and holiday-specific items. Make sure there’s no legal issues with your product, such as required certifications or patents. Identify ways to improve or create variations on the product. That could be a new, previously unavailable color or maybe a necessary accessory. Go for lightweight, easy-to-ship products. It helps keep your shipping costs and FBA fees way down. 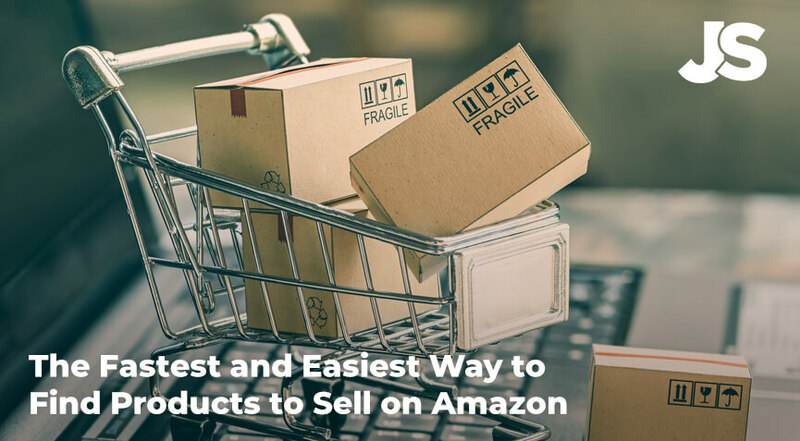 How to find products to sell on Amazon the easy way. Back when I started selling on Amazon, you had to do all your research by hand in a Google or Excel spreadsheet using a couple of tricks to estimate sales volume. Sometimes, it could take a couple weeks to get a decent estimate. And even then, it was a crap shoot. So I created that better way… with the Jungle Scout Chrome Extension. What is the Jungle Scout Chrome Extension? Basically, the Jungle Scout Chrome Extension takes all that important information I mentioned above: number of units sold per month, sales price, review counts, and organizes it into a spreadsheet built directly into your browser. All in a matter of seconds! 1 – Search for a product on Amazon. 2 – On the search results page, click the “JS” button. 3 – Watch as the Jungle Scout Chrome Extension organizes the data. And it’s that simple! Now you have a ton of data at your finger tips. Additionally, you can track your favorite products with the Jungle Scout Web App by simply clicking the + sign to the left of the product listing. What is the Jungle Scout Web App? In addition to the Chrome Extension, Jungle Scout also has a Web App that offers completely different functionality than the Chrome Extension. While the Chrome Extension works within Amazon’s actual search pages to identify products you’re already aware of or stumbled upon, the Web App you tools that helps you actually find those product ideas. This graphic below helps you understand how both apps help with the product research process and how they work together. What if I’m still having trouble selecting a product to sell on Amazon? Of course, just having that data sometimes isn’t enough. After all, how do you know if something is a good product to sell on Amazon just from the sales figures and reviews? This was still the question I was getting hit with, even from Chrome Extension users. After all, all that data can sometimes be daunting. Obviously, new sellers don’t want to make mistakes. I was the same way back when I started, struck with analysis paralysis. So, I came up with a powerful algorithm, sort of an “if/then” equation, if you will. If sales are X and competition is Y and there are opportunities to improve on the product and listing, then it gets a score of Z (1-10). From there, I picked the products to sell on Amazon with the highest scores. And I avoided the products with low scores. 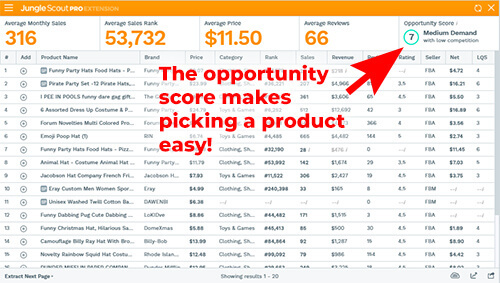 This “opportunity score” that I developed was the foundation that I built my own successful Amazon business on. And I knew that this opportunity score was too good not to share. After all, not everyone has the time to do complex math equations to find good products. So, that’s why I took that formula and made it a part of the software. Enter the Jungle Scout Opportunity Score. What is the Jungle Scout Opportunity Score? The Opportunity Score is an in-house algorithm, factoring in the demand for a product according to units sold, competition (the number of reviews for the Top 10 products under a given keyword) and listing quality (determined by a number of factors like title, keywords, number of photos, quality of bullet points and description. This will help you decide if this opportunity is a worthwhile one for you. NOTE: You need to be on a Product Results page (not a Product page) to see it. How does the Opportunity Score help you find products to sell on Amazon? The opportunity score works in two ways. First, it’s imbedded into the Pro version of the Jungle Scout Chrome Extension. So every time you click the “JS” button and open up the extension, it appears in the top right corner. 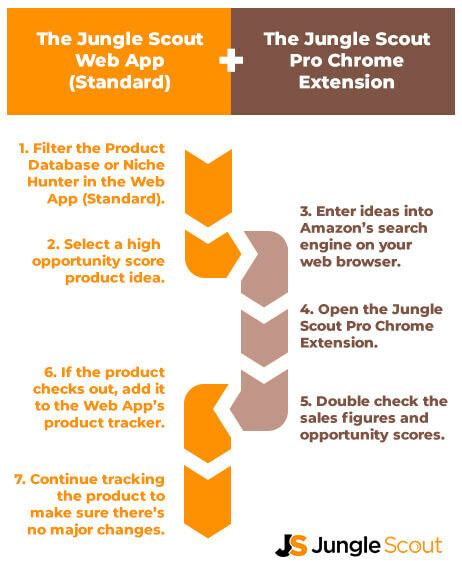 TheJungle Scout Chrome Extension awards every product idea an opportunity score. Here’s one for “funny hats”… a 7! 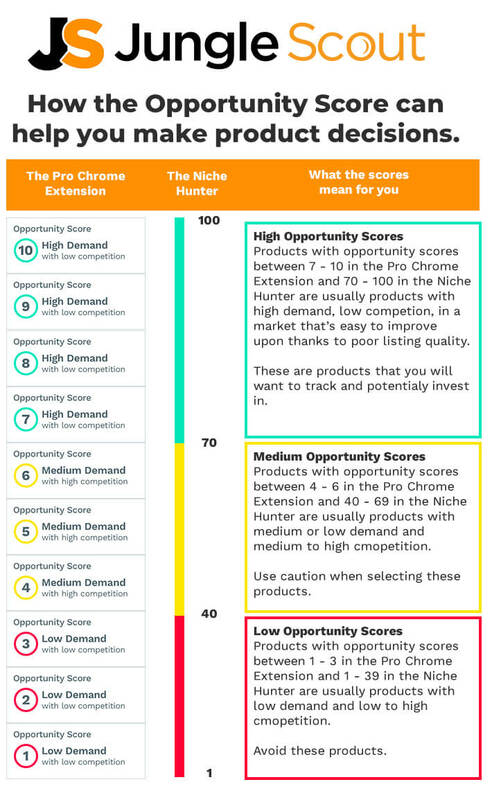 Additionally, when you use the Web App’s Niche Hunter, the opportunity score is one of the many filters that can help you find products. The Jungle Scout web app makes it easy to sort potential products by their opportunity scores. Sort of like the graphic a few paragraphs above showed, instead of looking for a product first then taking its pulse with the Jungle Scout opportunity score, instead you can look for high opportunity scores first and then see what products come up. The difference between the Web App and Chrome Extension opportunity scores. You might notice right away that the Web App and Chrome Extension’s opportunity scores look a little different. For starters, the Chrome Extension’s opportunity score is a number ranging between 1 and 10, whereas the Web App’s opportunity score is graded on a scale of 1 to 100. Don’t be alarmed! This is intentional. Because the Web App takes up a little more room on your browser, it’s easier to convey more information. We believe in delivering as much information as possible to help you make the right choice. Meanwhile, on the Chrome Extenion, there was only so much room, so we rounded the numbers of to places of ten. But the score still works the same way: higher is better. Additionally, the color coding is the same. Opportunity score colors range from red (very bad, avoid this product) to yellow (decent, but you can probably do better) to blue (awesome, this is a huge product opportunity). Below is a graphic that demonstrates what each of the Opportunity Scores look like for each level, and what it means for you. How do I get the Jungle Scout Opportunity Score? There’s two ways that you can get the Opportunity Score. Web App advanced integration. Looking for an easy way to keep tabs on hot products? Now you can instantly track products with the Web App with the click of a button. Sales item profit calculator. A lot of new sellers don’t know how to calculate their profits. That’s why we’ve included this built-in calculator to help you predict your product’s future. Dimension and weight of items. Determined to find lightweight products? This information will help right away, saving you the trouble of finding out the hard way. FBA Fee estimator. Want to know how much Amazon’s going to charge for referral and FBA fees? We break it down for you. The next best way to get a hold of the Jungle Scout Opportunity Score is with the Web App’s standard package. The Web App standard package is only $69 per month or $49 per month if you sign up for the annual plan. In addition to the Niche Hunter tool, which lets you easily sort high opportunity products to sell on Amazon, it also gives you the following tools. Product Database. Looking for an easy way to sort through all of Amazon’s products? The product database does just that, allowing you to sort by product tiers, seller types, prices reviews, ratings, and more. Product Tracker. Did you know it pays to keep tabs on hot selling products? With the standard package, you get up to 80 products that you can track. And thanks to the JSP’s web integration, you can do it straight from the Chrome Extension. Historical Sales Rank and Data. Want to see how a product fares over time? No problem! In addition to the “snapshot” we provide, giving you a glimpse at how products are doing right in the moment, we also show you how the product’s done in the past, too. International Marketplaces. Looking to sell in more spots than just the US? The web app supports all major Amazon marketplaces. Up to 2 Users. Have a fast growing Amazon business? You can have up to two users with the Web App’s standard package. Hopefully, this run down on how to find products to sell on Amazon’s got you chomping at the bit to get started. I can honestly say that selling my own products on Amazon has changed my life. It gave me the opportunity create the life I want and grow as a #freedombuilder, and hopefully it can do the same for you. If you have any questions about the Jungle Scout Pro Chrome Extension or the Web App Standard Package, or maybe even questions about the Opportunity Score and finding products to sell on Amazon, please leave a comment below. For more information on creating your own products to sell on Amazon, click the link below to get our free course on how to sell on Amazon FBA. I purchased the chrome extension about 1 1/2 years ago. It was a one time purchase for the lifetime of the product. I just read that it’s now an annual charge of right at $200. Does that mean I no longer have it for life? Great question! As someone who’s had the CE for 4 years, I asked the same thing. Anyone who buys it before (I think) the 31st, is grandfathered in. I heard there is an App that let you scan a product and gives you the demand and price it is selling on Amazon. Is that right? which app is it? There are some scanner tools out there to research, but typically this would be most useful if you were going the arbitrage route – that is, buying merchandise from another market to sell on Amazon. In that case, you’d want to know how much that product is selling for on Amazon to decide if it’s worth buying to resell. A scanner app could give you the current Amazon price, but the info wouldn’t be as useful if you’re looking into private label selling. So, unfortunately, we don’t really have an app to recommend. I hope that helps clear some things up! While doing product research to find a new product to launch, do we need to consider the number of reviews and sales of everything on the first page of that category i.e., ‘sponsored’, ‘top rated from our brand’, ‘best seller’, and ‘Amazon’s choice’? When trying to verify demand and competition, you’re going to want to take a look at the top 10 sellers, which you can find in the organic search results on Amazon. The easiest way to get this information is to search for a keyword for a product, and then open the Jungle Scout Chrome Extension, which will show you the top 10 products for that keyword and their respective estimated monthly sales as well as number of reviews, listing quality score, opportunity score and more. Looking at the sponsored ads just indicates how competitive it might be to compete in the Amazon PPC space for that product. And any products with a best seller or Amazon choice badge just indicate who your top competitors would be at that given time. The key thing is to get reliable sales estimates so you can verify demand, and identify trends or seasonality before making a decision. I still am learning how to do JS. This helps me. I am sorry that I could not afford the$200 one but I will doso later. Meanwhile I will learn how to use the cheaper one!!!! Thanks for an insightful and well-detailed post. Nice post you’ve written here. We have a ton of great content across the blog for beginners like you, and this would be a great place to start to get familiar – https://www.junglescout.com/how-to-sell-on-amazon-fba/ Hope this helps! Love your products…….I have yet to find the elusive product with an opportunity score of “10”…..or even “9”! Would you guys mind letting me know how reliable the ‘opportunity score’ is in JS Chrome extension ? I found a product that has score of 9 under general search and score of 10 under a respective department, however, would like to make sure before pulling a trigger on my first product. Any help would be much appreciated.